First, my apologies for this long absence from my blog. Much of my time and energy over the last two months was spent on travel to and in India. 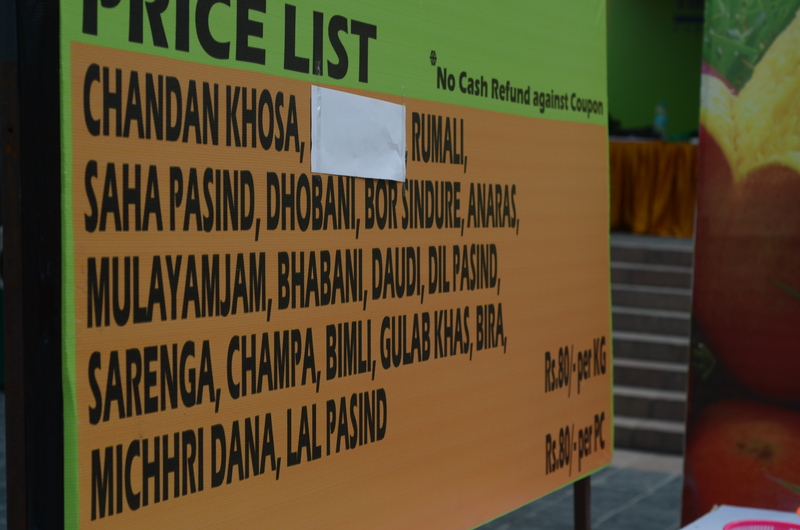 My initial plan was to visit the popular food joints in the different cities that I was visiting (primarily Calcutta), and to recreate the recipes at home, or to draw inspirations from them. Indeed, I visited most places on my list and felt completely satisfied, but I wasn’t sufficiently inspired. I felt that my first blog post from Calcutta couldn’t be a simple recreation of a popular recipe, but it had to use some distinctive ingredient from the region. 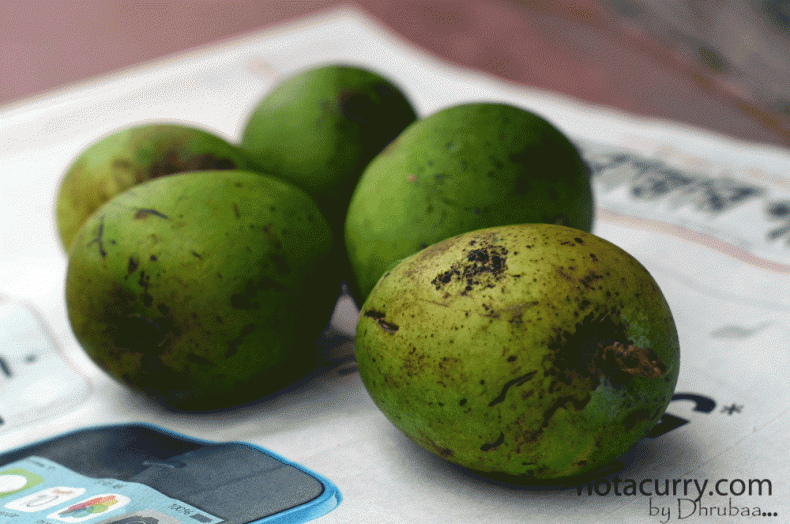 It wasn’t until last week that I found my inspiration–mangoes! 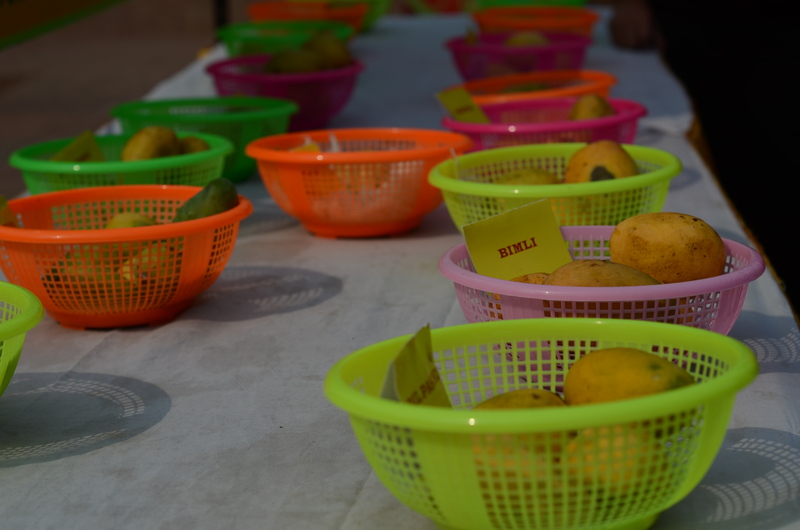 I was invited to a mango fair last week that showcased 19 varieties of mangoes from different regions of the country, and a variety of delicacies, both sweet and savory, that used mangoes as their primary ingredient. I felt like a kid in a candy store, except I like mangoes more than candies. 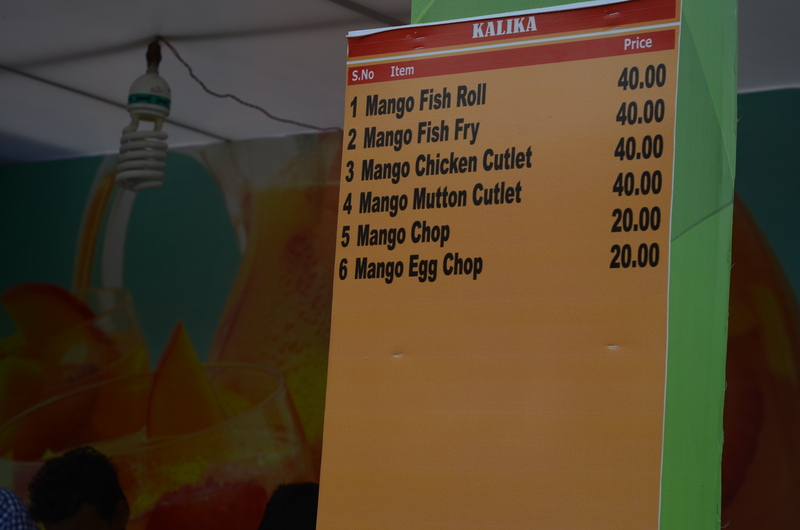 There were slow baked mango yogurt, mango sandesh, mango kulfi, fried fish marinated in grated raw mangoes, egg devils with raw mangoes, and mango shakes to name only a few. Summers in Calcutta are extreme with temperatures reaching up to 45°C (112°F) and humidity of over 90%. Yet we long for summers in this country. Mangoes make everything sweet and bearable. My childhood memories are imbued with mangoes. I distinctly remember that summer mornings in our kitchen in those days would religiously start with my aunt separating the eatably ripe mangoes from the less ready ones for the day’s consumption, soaking them in buckets of water, and peeling and cutting the raw mangoes and marinating them with turmeric powder and salt in a cane basket to be used in the savory dishes. Our balcony and terrace in those days would be lined with flat cane platters filled with cut raw mangoes drying in the sun for pickling. To this day, nothing reminds me of my childhood more than a jar of mango pickles. Even today, a normal summer breakfast in my home comprises of ripe mangoes with puffed rice and milk, followed by raw mango lentils and potato fritters with mango chutneys for lunch, followed by raw mango fritters and mango pickles for evening tea, concluded by fleshy juicy and sweet mangoes for supper. And my family is no exception in this regard. So, I figured that nothing screams summer Calcutta more than mangoes, and decided to devote my next few blog posts to mango recipes. My first is a traditional Bengali mango panna, a simple sweet, tangy and spicy thirst quencher. Roast the mangoes at 400°F (200°C) for 20 minutes, or until tender. Immediately soak them in room temperature water to prevent the mangoes from hardening. Mix all the other ingredients in a large bowl and let cool in the refrigerator. When the mangoes have cooled, peel the skin and separate the pulp. Run the pulp in a food processor, or through a sieve, to derive a smooth consistency. Mix the mango pulp with the water and serve with ice. If green mangoes are unavailable, use ripe mangoes. Just go easy on the sugar for close results.